Since its early days, Siril can take user inputs as textual commands, from the command line. Recently, more commands have been added, enabling for a basic automated processing of images. Commands can be stored in a file that we call script, and they are executed one after the other. Some commands can be used in scripts, some cannot, this is indicated in the help of the command line from the graphical user interface of siril. Since release 0.9.9, Siril can execute scripts from a file. Since 0.9.10, commands can also be taken from a named pipe. There are two ways to start a script manually: using the @ keyword on the command line, followed by the script name, as explained here, or use the script menu. The script menu only appears if some scripts have been found in the script search directories defined either by default or by the user in the program settings. 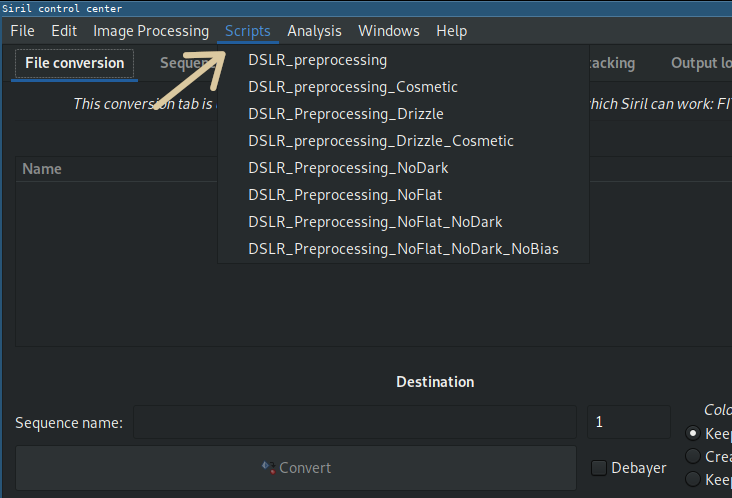 DSLR_preprocessing.ssf: script for DSLR color camera preprocessing, Uses bias, flats and darks, registers and stack the images. DSLR_preprocessing_opt.ssf. Preprocess images with dark optimization: added 01/24/2019. DSLR_startrail.ssf. Preprocess images and build a star-trail: added 02/12/2019. DSLR_preprocessing_opt_diff_biases.ssf. Preprocess images with biases at same ISO of darks and other biases with same ISO of flats (generally the lowest): added 03/02/2019. DSLR_preprocessing_Merge.ssf. Alignment and stacking of already pre-processed images from different acquisition sessions achieved under the same conditions: added 24/03/2019. DSLR_preprocessing_Align.ssf. Alignment of images already pre-processed from different filters and made under the same conditions to make Ha-SHO or Ha-RGB for example: added 24/03/2019. We encourage users creating their own scripts to publish them and make a link in this page with a basic description of what they do. We also suggest users with monochrome or CCD images and several filters to use Sirilic to generate scripts or Sirilot to provide a more suited way to manage all the files required for such a processing.